This is a summer beach post that I wrote about four years ago. It’s one of my favourites but I was afraid it might be lost in the archives… so I have revived it! Same beach, same guys (I think), same beach food … this year, however, there is a newcomer, the helvacı: he also does a balancing act with a tray on his head selling those wrapped flaky wafers or kağıt helva. His is the only thing I have occasionally bought as with a scoop of ice cream on top and a serving of say, syrupy cherries or plums, a quarter or half of one of those wafers makes a fine summer dessert! There you are, at last, stretched out under a sun umbrella, the sea a dazzling blue in front of you, a cloudless sky above, and what is your heart’s desire? Seems to me it would surely be something like a choc ice or vanilla wafer with a Cadbury’s Flake stuck into it. Hot dog? Smoothie? I know! an ice lolly! 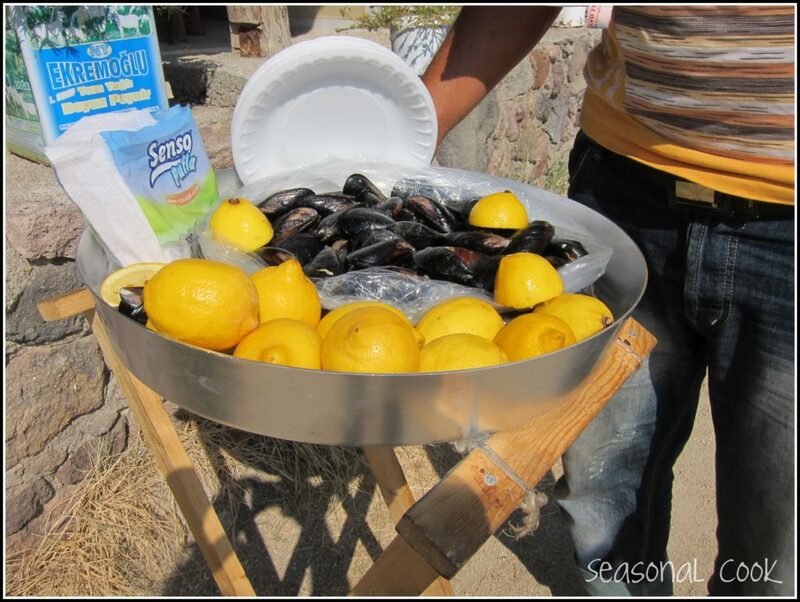 When you are on a Turkish beach, you will see these guys flogging up and down in the heat selling their wares displayed on trays which they carry on their heads. Believe me, there is a receptive audience. The mussels will be prepared in private homes and over time, these will acquire a reputation for being both tasty and for being prepared under hygienic conditions. 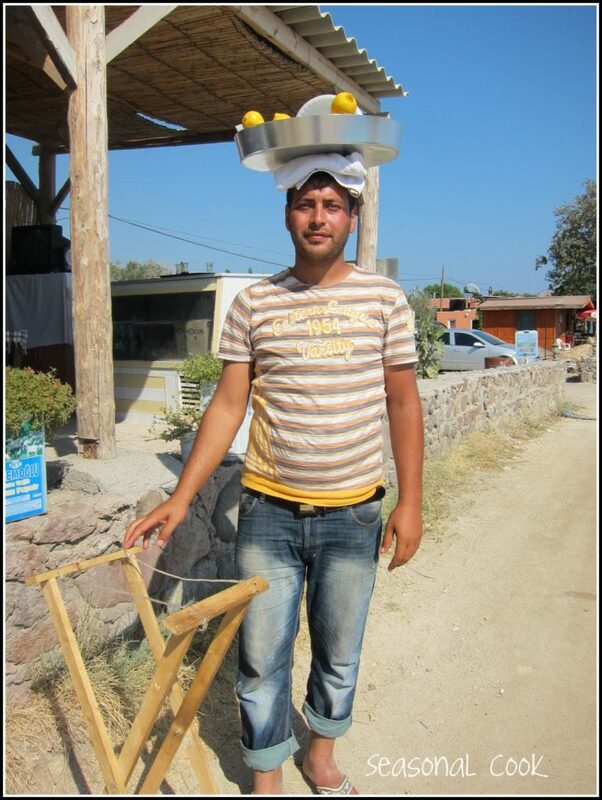 After the midyeci, we have themısırcı, the corn-on-the-cob vendor who pushes his little cart. In this area, the beaches are very stony so he has a hard time of it and I feel quite sorry for him. He doesn’t, of course, grill his corn but this time, boils it. I’m not sure how hygienic this is but he manages to sell a lot. Corn is always popular. 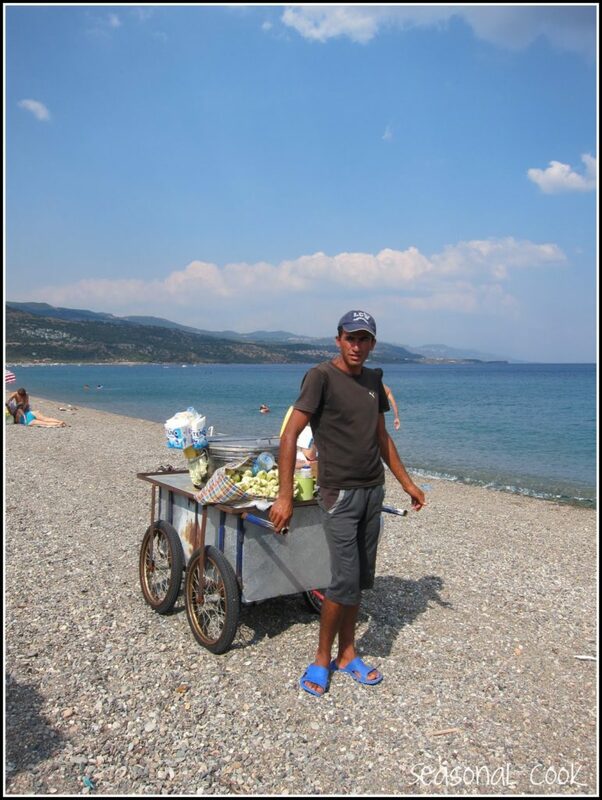 And the third seller in this beach scenario is the simitçi. 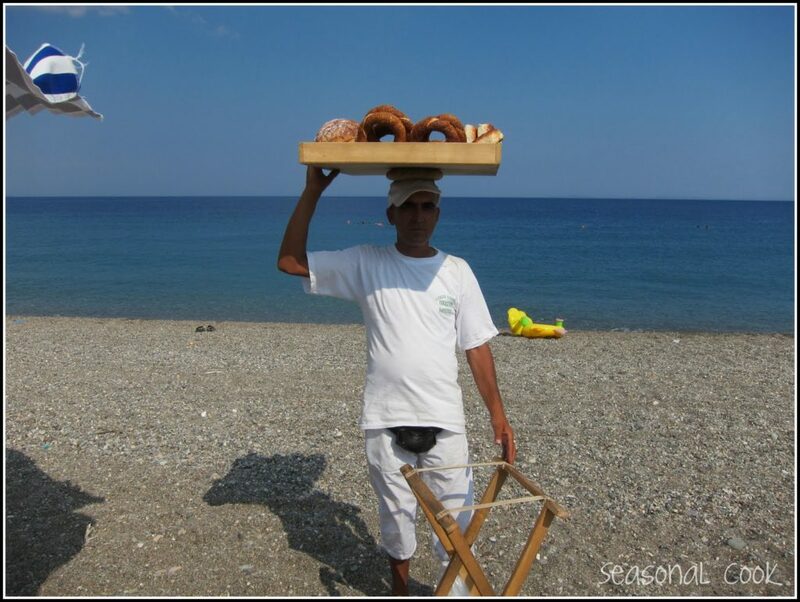 He performs a balancing act with his tray of round simit on his head. When he spies a potential group of buyers, he opens up his trestle legs and rests his tray on top of it. Simits are delicious: not sweet but more in the bread category and are amongst every Turk’s favourite foods. They are sprinkled with pre-toasted sesame seeds which adhere to the pekmez or grape molasses in which the pastry is briefly dipped before baking. Usually eaten for breakfast instead of bread with jam or cheese, or in the late afternoon traditionally with kaşar peynir/kaşar cheese and çay or Turkish tea. I shouldn’t forget to say that when you are on a Turkish beach as the sun’s rays start to lengthen and everybody is feeling mellow after a day at the seaside, best of all, çay is brought round – a very civilised custom – and everyone chats with everyone else.